Home Facebook Tips Security Facebook Takes on Google+ with its New Private Sharing Feature. Facebook Takes on Google+ with its New Private Sharing Feature. Google+ boasts on its privacy features as Facebook was very weak in that area. Now Facebook has learn a lesson from Google+ and enabled controlled sharing. Now you do not need to broadcast your messages to the entire junta if its too personal. Facebook has very recently added a new feature which will enable you to share your updates with only specific people. In all Facebook has enabled 3 new features for your updates. Whom to share your information with? Using these settings you can easily broadcast your message with selected people in your listings. By default you can share with 3 categories of people Public(Everyone), Friends, Specific. 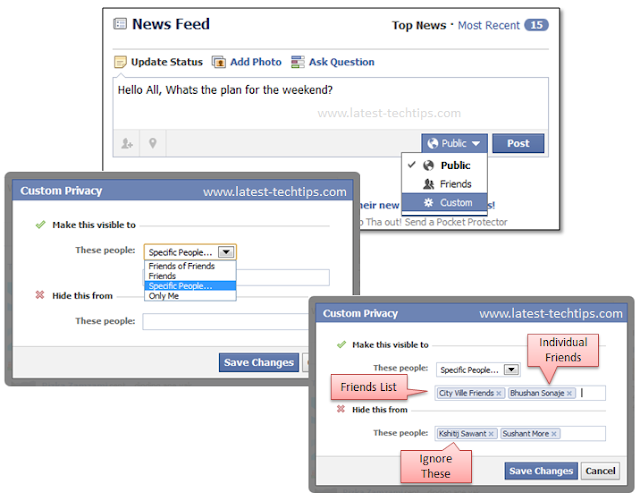 If you have created Friends List already in Facebook then this feature can be used more effectively. Now Lets see How you can actually use the Latest Private sharing feature in Facebook. 1. First you type in your message. 2. Click on the Drop Down next to post button. 3. Specify people with whom you will share the post. You can save these settings as Default and use them for future Post sharing. Share the tip with your friends so that they too are aware of it. There is still a very basic Difference between the sharing in Facebook and in Google+ Circles. in Google+ people who don't know you may be part of your circles and in Facebook you share with Friends List who you are friends with.